Jaspal was made ambassador. Do you know what price he paid for it? 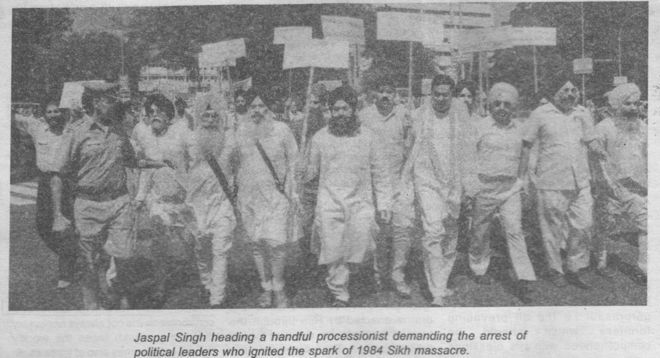 Finally it were the Sikh masses themselves who rejected terrorisrn to restore peace in the trouble torn Punjab and thus won the country's battle .Right from the 'Freedom Struggle to Kashmir crisis of 1947, wars of 1962, 1965 and 1971 their patriotic role was exemplary one . Notwithstanding this the ruling parties in Delhi have always suspected the Sikhs and supported and patronized such individuals and institutions which calculatedly harmed Sikhism and its concepts.lt is for this reason that many so called 'saints' and 'deras' supported by the Congress are flourishing. May we ask what is the credibility of Jathedar Rachhpal Singh the self styled president of Akali Dal Master Tara Singh or for that matter late Dr. Gopal Singh who was always blessed with one or the other coveted assignment. B.S.Goraya suspects here that it is continuation of this dubious Policy that one Dr. Jaspal Singh who has written a book to distort a basic Sikh concept is appointed as ambassador to Mosambique. He is a Ph.D. scholar. A lecturer by profession. Member of Delhi Sikh Gurdwara Management Committee for a long time now 3 times Secretary of DSGMC, son of a very humble Preacher who migrated from POK Kashmir- The Delhi Sikhs know him as a crusader for justice. He became fully active after the 1984 riots and became known for very provocative speeches. Several cases of sedition were registered against him and he went to jail several times. He then writes a book to distort a Sikh concept. All cases against him withdrawn. Besides he begins to operate a big bank account which even humbles big businessmen. He was presented a brand new Maruti and today has a new Esteem. Jaspal has allegedly played with Sikh tenets, on many occassions. First of all he published a book in Punjabi-'Raj da Sikh Sankalap'. Then he allegedly played a dubious role in the demolition of some structures at Majnu ka Tilla gurudwara. He also participated in the Vishav Sikh Sammetan at Amritsar. Whether or not the public could understand his allegedly anti sikh moves he went on unabated. Before we talk about the 'book that he wrote it is pertinent to mention here that lndia is a democratic ' republic and every community or group has a right to vote and form a government through democratic means. lf Sikhs aspire to do it there can be no harm Provided the means are legal and democratic. lt is by now an established fact that in Sikhism religion and politic are inseparably intermixed. It is a fact Sikhs during their morning ahd evening Prayers make loud cries ‘Karega Khalsa, Aki Rahe Na Koi,"
History is witness that even Guru Nanak was Put behind the 'bars by Emperor Babar for his utterances which had Political overtones. Complaints against the ll and lll Nanak were also investigated by Hamayu and Akbar. The V Nanak was martyred by Emperor Jahangir. The Vl raised armies fought and won battles. The Vll was also summoned by Emperor Aurangzeb while the Vlll Nanak died at Delhi during his days of hearing in the Mughal court and Gurudwara Bangla Sahib commemorates his death in Delhi. The Ninth Nanak was martyred in Delhi while the 10th fought many battles and whole of his family was eliminated and he also died of a stabbing at the hands of a Pathan -hireling of Suba Sarhind Wazir Khan and the assassin’s mother was also honoured by the Emperor. Before the Xth Nanak breathed his last he bestowed the Sikhs of a rule. Contemporary literature makes the mention of such a blessing. Be it the Kavi Senapati's Sri Gur Sobha (1711 AD), Sahib Singh's Sau Sakhi (1734 AD), Gur Bilas-Kuir Singh Kalal (1751), Basanwali-nama-Kesar Singh Chhiber (1769), Rahitnamas: as many as 21 each ascribed to Guru Gobind Singh written in the first half of eighteenth century) and the later Sikh sources numbering again about 20 almost all revolve around this basic concept of polity in Sikhism. 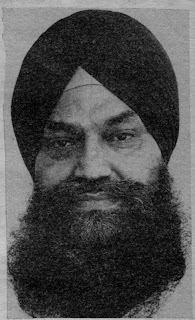 ln his motivated work which lacked objectivity 'Raj da' Sankalap,, Jaspal claims that his work is based on the Sikh holy granths and other Sikh sources historic scriptures. He considers Guru Granth Sahib, Warran- Bhai Gurdas and Dasam Granth as primary sources and rest of the above mentioned scriptures as secondary sources and before proceeding gives a long list of his sources and painstakingly picks up such references only which suit his motivated line of thinking. Surprisingly no where not even once Jaspal makes any mention of the couplet 'Raj Karega Khalsa', the major Rahitnamas of Khalsa Panth including the ones by Bhai Nandlal, Bhai Parhlad Singh Sau Sakhi and their reproduction in the later sources tike the Gur Bilas by Kuir Singh Kalal and Panth Prakash Giani Gian Singh. He fails to take cognizance of a full chapter on the Code of Conduct for the Sikh rule and state enshrined in the Prem Sumarg by a Sikh devotee written in 1765 AD where the devotee claims that this was in accordance with the wishes of the Xth Guru. As a matter of fact there is no such Sikh scripture which does not mention the concept of some sort of Sikh rule. Jaspal arbitrarily 'chooses references in support of his claim and writes that there is no such thing as the Sikh rule in the holy Sikh scriptures and ignores references which hamper his thesis. Thus he deliberately avoids context in which a particular line or couplet was composed. Since the concept of rule is directly linked with the basic principles of Sikhism, Jaspal fails to take cognizence of that. While Nanak's concept of God is not a very complicated proposition. Rather it is the lk-onkar. nirankar and gurprasadi i.e the all Prevading formless which should be comprehended with His blessings alone and cannot be understood through an empirical approach as He is beyond the basic factors of 'time, space and matter on the basis of which all the scientific knowledge is based. On enlightenment a Sikh becomes a 'gurmukh'. lt becomes clear to the 'gurmukh' that this whole world is a drama enacted by Him through the tools of 'haumen' i.e. ego and 'naam' the immanence. The followers of other religions on enlightenment do not proceed further and renunicate the world which is full o, ego or the evil forces. The likes of medieval bhagats l fall in this category. lmbibed in the Almighty the 'gurmukh' begins to bow before His will (hukme ander sabhkoi -p: 'l-GGS). How can the gurmukh presume that the 'Haumen' or the ego which is the mother of all evils is beyond His will. Gurmukh knows it is also within His will and is a tool to Perpetuate the drama. The gurbani thus treats the universe or the life a drama. Since the drama is enacted by the Lord himself His lovers the gurmukh would thus wish to participate in it. Since their materialistic lust stands vanished they would prefer the role of hero in the drama rather than that of villain. It is obvious when the gurmukh is interacling or opposing the villain or the evil of the forces of ego he may at tmes confront with the state. lts glaring examples are the lives of the Gurus themselves or that of Bhagwan Rama Krishan etc. Now with continued confrontation it is not always necessary that the gurmukh faces the worldY defeat only. he may also at times crush the evil like Lord Rama did in Lanka. lt would be absurd to note that the gurmukh would again leave the Lanka at the mercy of villains. The gurmukh may leave his men to rule where administration means service. And according to Sikh concepts this could be termed as the Sikh Rai or State. lnterestingly, the gurmukh would also rise if any egoistic forces emerge and rule the Sikh State in the garb of a Sikh. His struggle is thus perpetual. The eighteenth century traditions of the Khalsa is a beautiful illustration of this principle about which a noted Sikh historian comments that 'rioting is the business of the Sikhs' (P243 :Path Parkash-Bhangu). Jaspal believes that the Guru would never have wished a rule for the Sikhs as the rulers become fanatic. Jaspal has surely thus evaded the history of the Sikhs of 18th century He should have illustrated his contention as the Sikhs ruled for more than half a century Jaspal has advocated. that whatever 'little references' on the Sikh state they came into being keeping in view the 'fanatic rule' of the Mughals. At a place however, he admits in a low profile, 'yes there are hints on the Sikh rule in the scriptures'. Jaspal contends that the fight against the egoistic or the evil forces was to remain restricted io the Auragzeb Era. He says that the Sikhism cannot be bound within the limits of space and time. But that is true of all religions. lslam too is no exception to it. lt will be satirical to advise the Pathans of Afghanistan that they should not aspire to rule since lslam was beyond the concepts of time and space. However we are sure Jaspal would not resort to such pieces of advice which are not paid for. ln his whole thesis, he advocates that the Sikh scriptures are opposed to the establishment of rule on the religious lines. Analysing in his unique style, he says fanatic State of the day i.e. Mughal Govts are the 'thesis' and the altenative Sikh state in accordance with the wishes of Gurus constitute 'anti-thesis' as a result of the collision 'Synthesis' is formed in accordance with Hegelian principle. interestingly he concludes the book straightway ignoring the result of references from Sikh historical scriptures although he claims thai his work is based on these as well. 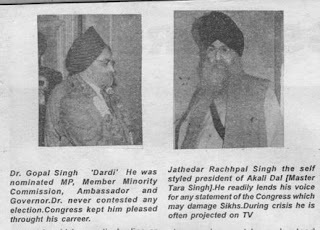 It should be highlighted that Jaspal's book was released at an impressive function held by the then Extemal Affairs Minister Mr. l.K. Gujral. The function was presided over by Air Chief Marshal Arjun Singh at the Delhi's prestigious Chemsford Club. All the criminal cases pending against Jaspal were withdrawn. 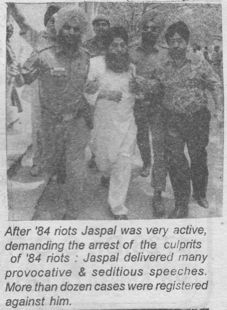 ln 1993 however another experiment with the Sikh community was carried out with the alleged connivance of Jaspal when some structures existing at Majni Tilla Gurdwara in North Delhi were demolished and Jaspal was very active in this whole affair. 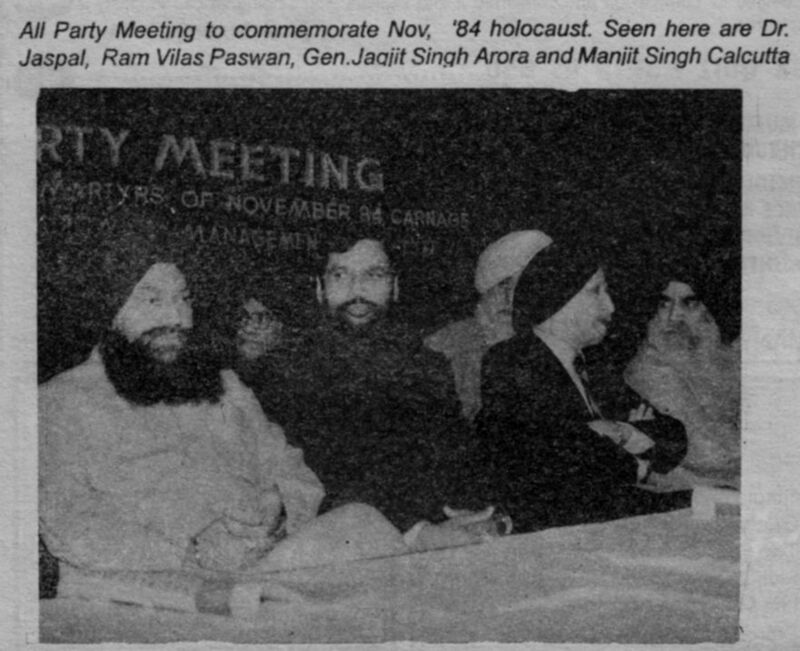 Jaspal was very active in the last Vishawa Sikh Sammelan which was held in Sept. 1995. He was Secretary of the Delhi SG Committee then and used his office and got a resolution passed which approved the Jaspal's thesis on the Sankalp. There Jaspal confused the so called Sikh intellectuals and insisted that the Sikh concept of the State was that of miri and Piri' which no one in the gathering could oppose Keeping in view sacredness of verbose text of the motion and the following day the news papers reported that the Sikh concept of the State was that of 'Miri and Piri' only.